Marshall Exteriors has been your local basement finishing contractor for 15 years, specializing in basement waterproofing and basement remodeling. Our experienced basement finishers have the expertise and skills necessary to transform your basement into a functional living space. Our basement finishing professionals are trained to handle each basement uniquely and provide custom design consultation. The Total Basement Finishing system offers the best in basement ceiling products, wall panels, flooring tiles and much, much more. Get a FREE Basement Finishing Estimate! Marshall Exteriors is your locally owned and operated Total Basement Finishing™ contractor in the New York area. We proudly serve Fairport, Canandaigua, Geneva, Newark and the surrounding areas. These homeowners called the experts at Marshall Exteriors to convert their cold, dark basement into a media room with a full bath and kitchenette. The TBF system was the best solution for the entire space with its innovative products. First the team installed the metal framing to support the Everlast wall panels that are resistant to mold and mildew. Once the electric was installed, mold and sag resistant ceiling tiles went up. The floor received ThermalDry interlocking floor tiles to give a durable yet comfortable solution to the concrete. A custom platform riser was built for the theatre seating with the same floor tiles continuing the flow of the room. The homeowners now have a warm and inviting space to entertain friends and family. The homeowners decided to convert a portion of their basement into a family room. Adam, the Marshall Exteriors Project Estimator, worked with the homeowners to design a space to meet their needs. The TBF system was the best solution for the entire space because of its innovative products. First, the team installed the metal framing to support the Everlast wall panels. These panels are waterproof meaning that if this basement ever gets wet, the walls will not absorb any of that water. Once the electric was installed, a product called Prestige ceiling tiles were installed. These tiles are mold and age resistant. Finally, the floor received ThermalDry Elite plank flooring giving the room a waterproof, durable and comfortable flooring solution. The homeowners now have a warm and inviting space to entertain friends and family. The homeowners were looking to transform their unused basement into extra living space for their growing family. The Total Basement Finishing system was the best solution for the entire space with its innovative products. First, the team installed the metal framing to support the Everlast wall panels that are resistant to mold and mildew making this the longest lasting basement remodel product. Once the electric was completed, mold and sag resistant ceiling tiles went up. The floor received ThermalDry interlocking carpeted floor tiles to give a durable yet comfortable solution to the concrete. The homeowners now have more room to enjoy their growing family. You don't need too worry about looking for subcontractors. We provide everything that is needed including walls, floors, ceilings, windows, lighting and electrical. We are your one-stop basement finishing contractor making it easier for you. The basement finishing system we use is so versatile that you can do anything you want with it. Creating an extra bedroom, mounting a tv or creating a covering closet. You won't find this system available anywhere else as we are the exclusive basement finishing contractor installing it in the finger lakes area. We can help you create the finished basement you want, whether that be a play area, home gym, downstairs bar or whatever else you can imagine. We are your trusted basement finishing contractor. We are your local, trusted basement finishing contractor in the finger lakes area. We proudly serve Geneva, Fairport, Newark, Canandaigua and the surrounding areas. The Total Basement Finishing System (TBF system) is designed to be able to flexibly fit different needs. It is ideal for custom basement remodeling projects. Once the your basement is cleaned, waterproofed and set up we can quickly finish the basement. The products that we use to finish your basement have extensive warranties and are completely waterproof. This means no water damage or mold growth if there is a leak in the basement. Your investment is safe and protected. This is something other basement finishing companies just can't give you. We have dealt with these types of challenges in the past. We know exactly what we are doing and unlike general remodeling contractors we specialize in basement finishing. We know things they don't. We have experience they don't have. We use products and materials they don't have access to. This is why we are the easy choice when looking for a basement finishing contractor. It was mentioned that our basement finishing products are completely waterproof. This is because they were designed that way specifically by a team of experts at the Total Basement Finishing Network. But we didn't just want the basement to be protected we also wanted it to look great. While the design was being developed we made sure to remember three things: lighting, design and flexibility. Basements generally have to rely on artificial lighting. So we made sure you had options. The drop ceilings a strong strong enough to support all types of lighting from fluorescent to task lighting, pendant lights and suspended lighting. You can create soft mood lighting for a movie and then turn on the brights when you need to clean up. If you do have window wells space our specially designed window wells maximize the amount of natural light reflected into the basement. We chose to make our basement wall panels a beige and off-white beige. These two colors make sense because they go with anything and any color palette. The textured pattern of the wall panels also hides any holes from nails and tacks and can be patched with just a bit of putty or even toothpaste! The surface is also easy to wash and pen, marker and paint come off. You can have an attractive basement that always looks good regardless of the style and use today or in ten years. People have different tastes when it comes to the look of their remodeled basement so we made sure to include some different options. We have eight different finished floor designs (all are waterproof). You can have tile, faux wood or even a subfloor for laying own carpet. There are also a variety of crown moldings, ceiling tiles, and wall designs. Our design consultants can help you choose exactly what you want. We want you to be smiling and showing your neighbors the work once we finish! Be very careful not only in who you hire to finish your basement but in what products to be use. To be honest, installing drywall, wood or other organic materials in the basement is a terrible idea. If there is a flood, leak or even high humidity your basement will grow mold and rot. You may as well flush your cash down the drain. Our basement finishing system complete with flooring, walls and ceiling provides protection as well as beauty to your basement. We back our products with a 50 year warranty. We are excited to show you what your basement can be so make to give us a call to get started. For 15 years Marshall Exteriors has been your trusted basement finishing contractor. 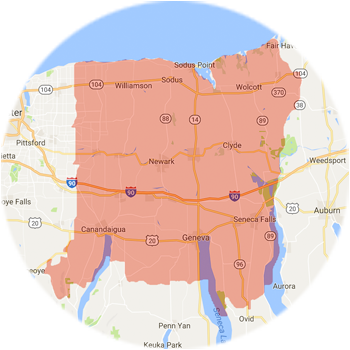 We proudly serve Canandaigua, Fairport, Newark, Geneva and the surrounding areas.